Quick question for you: What’s the easiest way to get camp gear from Point A to Point B? Answer: The Hig h Sierra Evolution 28” Drop Bottom Wheeled Duffel. Yes, it’s a mouthful—but its name is the only complicated thing about it. 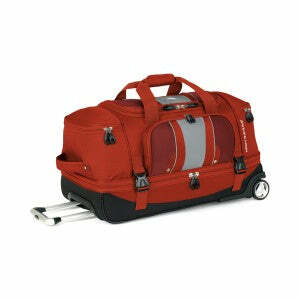 This wheeled duffel is just what the doctor ordered. It makes for extremely easy travel and very convenient storage. Parents, let me tell you why the Evolution is a smart decision. First of all, The High Sierra Evolution Wheeled Duffel Bag was built to last. This duffel bag is made from mini diamond ripstop and mini weave Duralite fabrics—in other words, this is one durable duffel. The Evolution is also made with a high-density foam structure that preserves the bag’s shape over a long period of time. Along with the shape of the duffel, the foam structure helps keep the bag lightweight. However, lightweight as it may be, this bag can hold a bundle! That’s another reason to go with the Evolution. It’s amazing how much can be packed away in this bag! The Drop Bottom compartment is large enough for you to fit your shoes or boots inside! And the duffel’s other compartments work great for storing folded clothes and making sure they stay folded despite your travels. Also, the zippered divider panel between the upper and lower compartments can be rolled up, to leave just one, big compartment. Pretty impressive, huh? Well, it’s not bad to look at either. It’s sharp and brightly colored. And last but not least—in fact, probably most important—is the bag’s practicality, the bag does more than just hold a lot and look nice—it travels like a treat too! If you’ve ever navigated an airport with a clunky wheeled duffel that you basically had to drag all the way to the plane, then you’re really going to love the smooth roll of this duffel. It keeps up. Made of nylon and polyester, the Evolution 28” Wheeled Duffel is built well, roomy, attractive, and excellent at making traveling easier. This duffel is perfect for camp. As always, thanks for reading, Camp Folks!